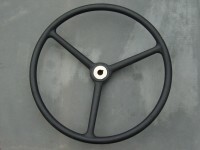 Steering wheel with key type fixing for early dumper steering boxes. Overall diameter 460 mm. Also see DCVPJ5104 nut and packing piece.